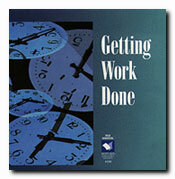 This kit is loaded with practical information for office-based employees. The first section covers motivation, diversity, sexual harassment and other productivity issues. The Life and Health Skills section focuses on information such as stress and anger management, communication and staying fit. The ample Safety and Ergonomics section addresses back care, sore necks, fire safety, first aid and other office safety issues. I Know I Have That Somewhere! Should I Work When I'm Sick? Looking for an Energy Boost?